The Nazis didn’t like the Jehovah’s Witnesses for a variety of reasons. 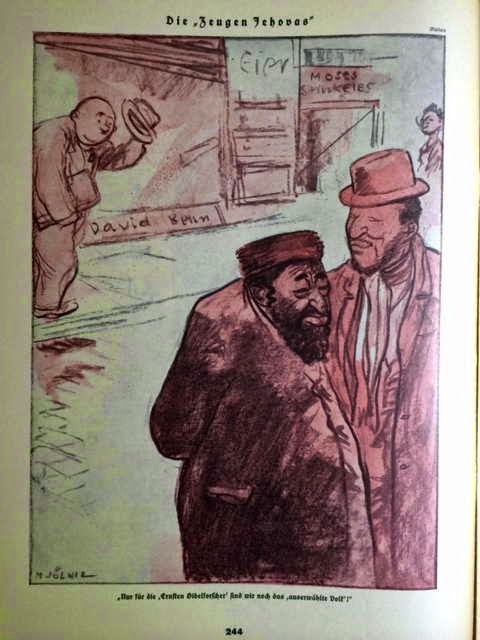 In this 1935 cartoon from Die Brennessel, one Jew says to another: “At least we are still the ‘Chosen People’ for the ‘Jehovah’s Witnesses’.” Die Brennessel was the weekly Nazi humor magazine, although it wasn’t all that funny. Other material from Die Brennesssel is available on the GPA.